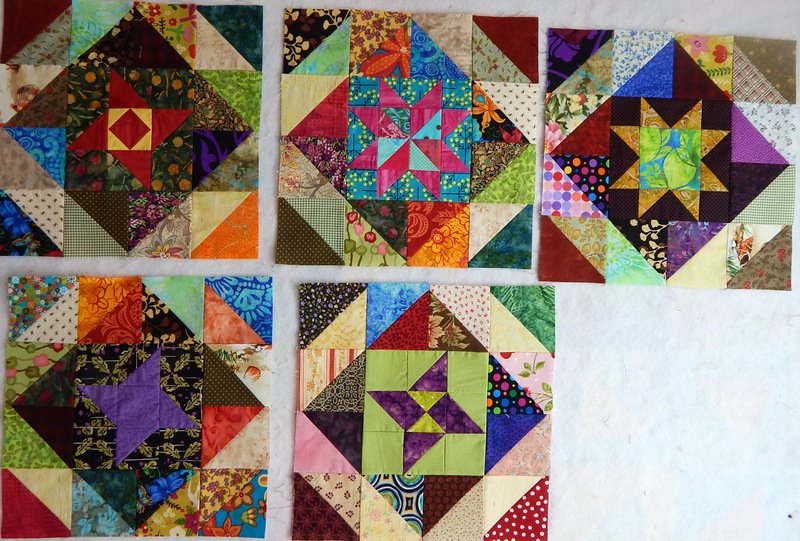 …from a recent very productive quilt retreat! Retreat! Need I say more? Here are some pictures of projects from our last retreat. A good time was had by all! Don’t know what the pattern was, but I love the way the flowers blend with the background! 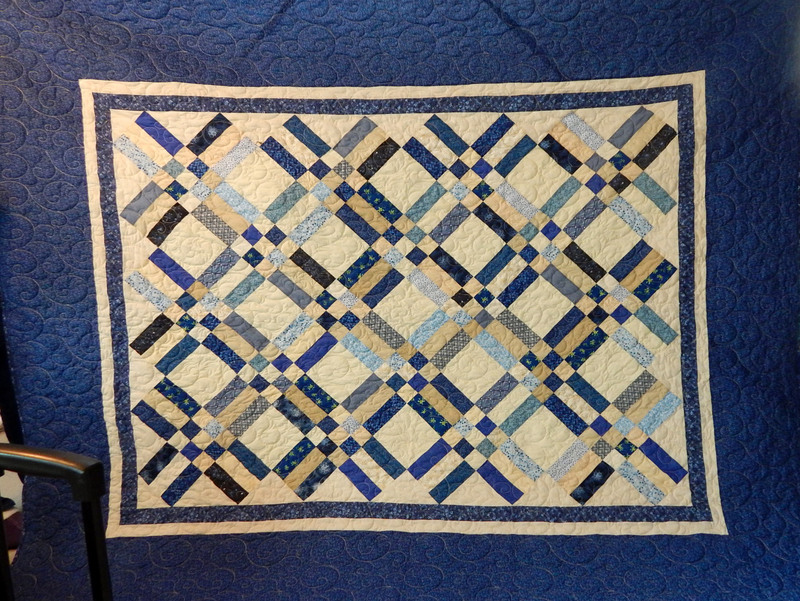 This wedding ring quilt was made to incorporate the fabric napkins used at the wedding! 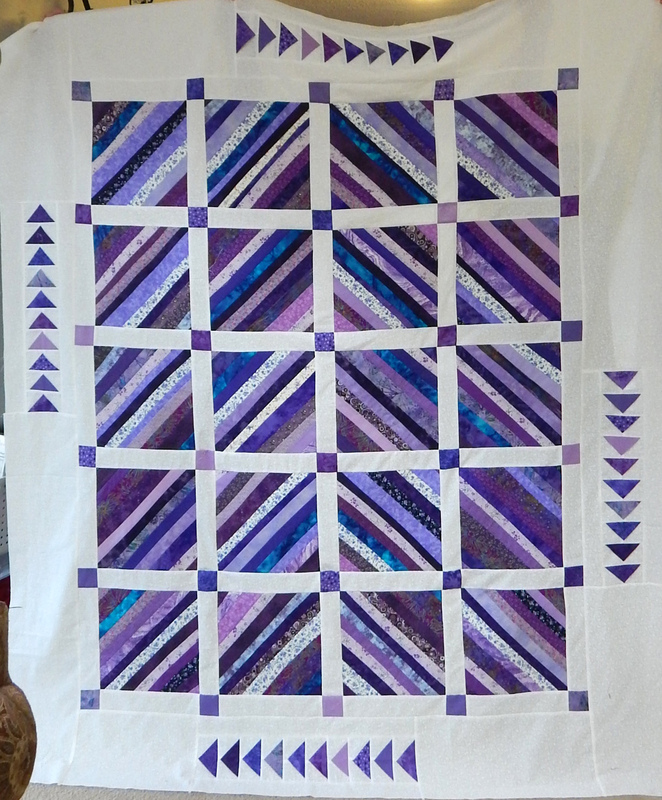 Here is the finished top that started out on the design wall. 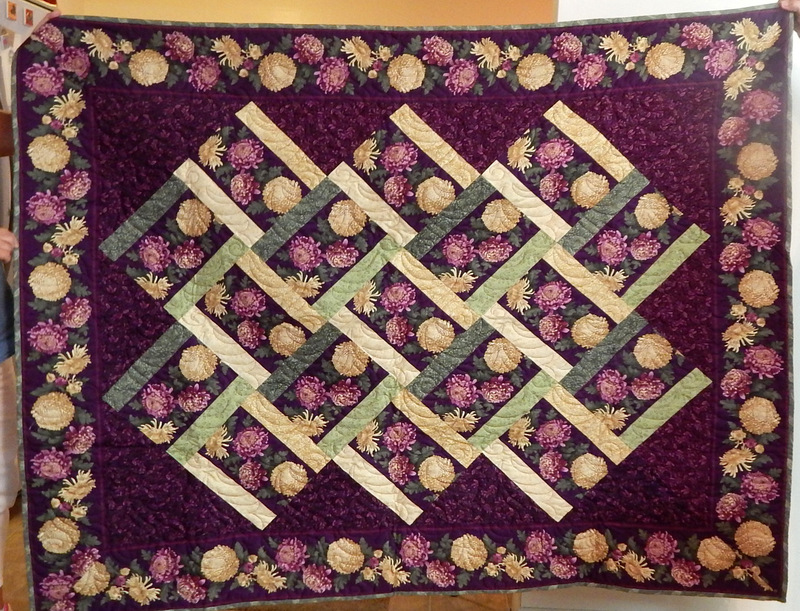 It was a Moda pattern. 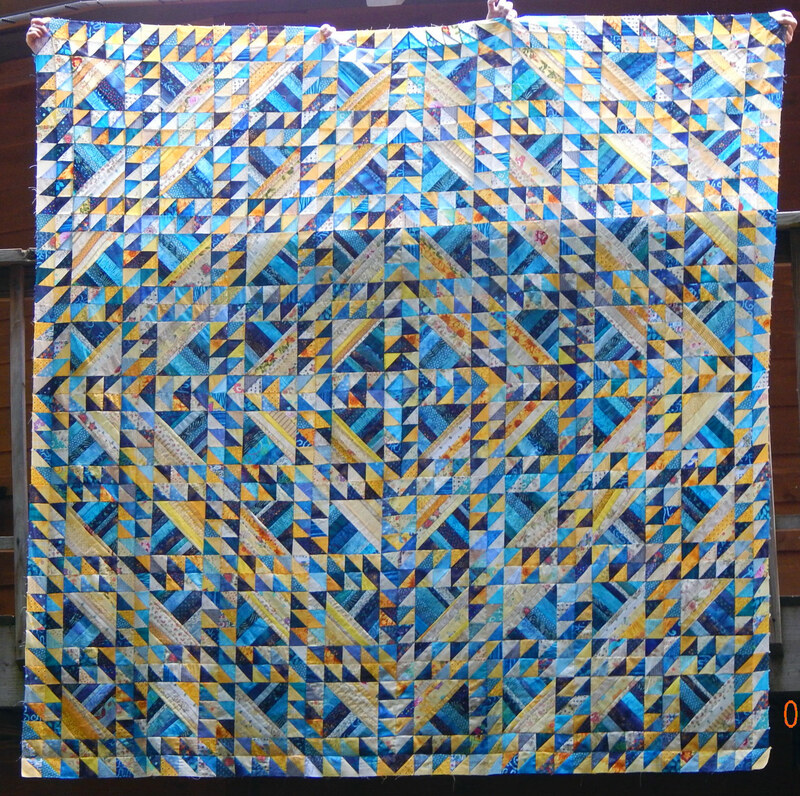 This was another really big one made using Deb Tucker‘s rulers. 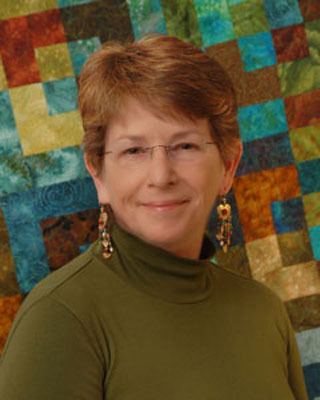 I enjoy Deb’s tagline: “Tools for the realist, not the idealist”! Isn’t this beautiful? And it was large–I cropped out a lot of it. Detail. These pieces were LITTLE! 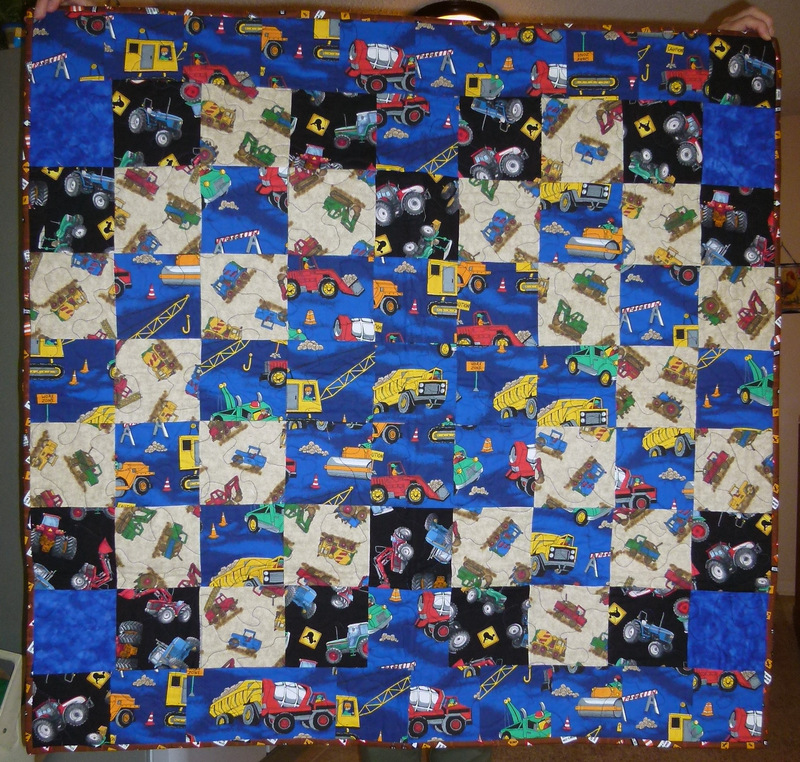 Next week I’ll have pictures of some of our quilts for Ronald McDonald House. 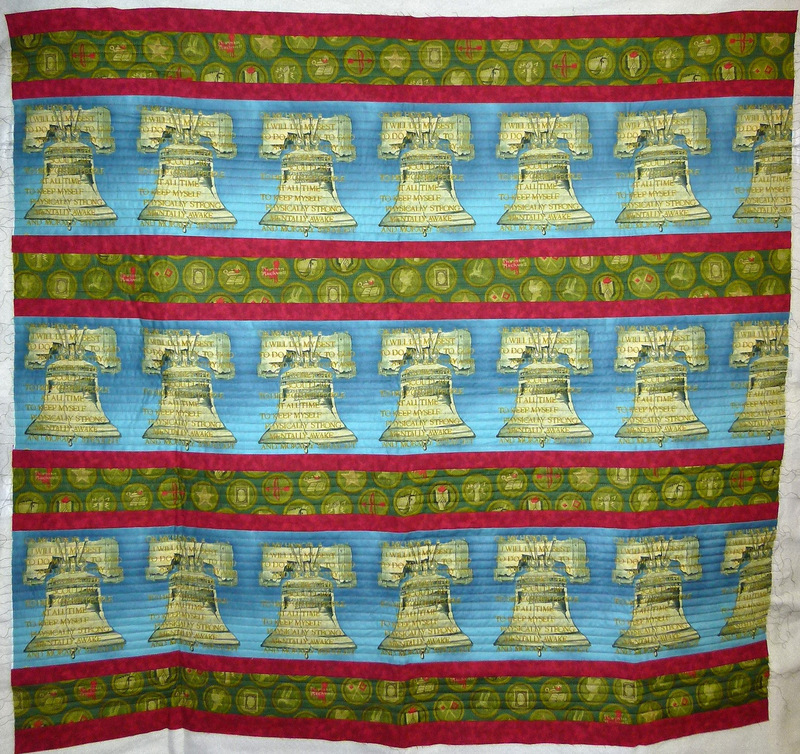 A friend who loves TINY things recently finished this postage stamp quilt of 5496 one-inch squares!!! 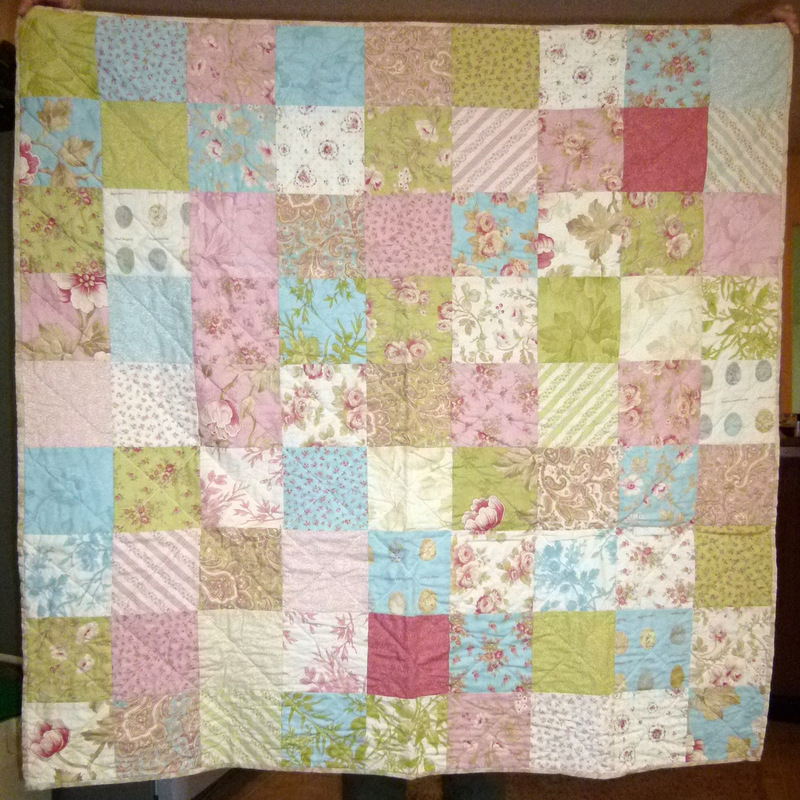 She will donate it to be raffled as a fundraiser at the retirement home where she works. 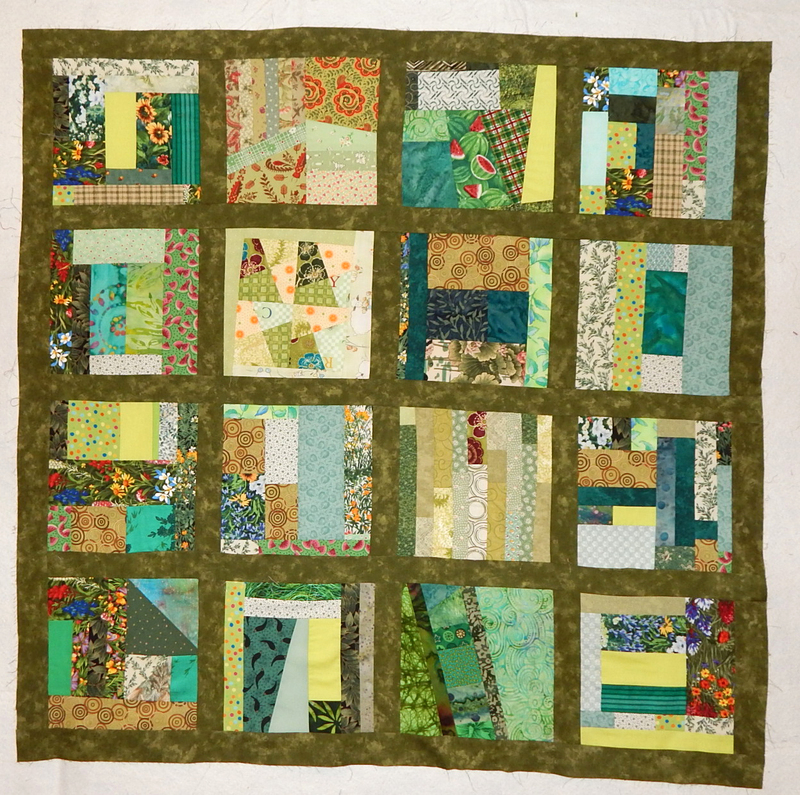 Jerri says this is “the ultimate I-Spy quilt”. She has found many, many, little novelty prints to put in the little blocks. She even has Elvis, though I didn’t get him in this close-up. 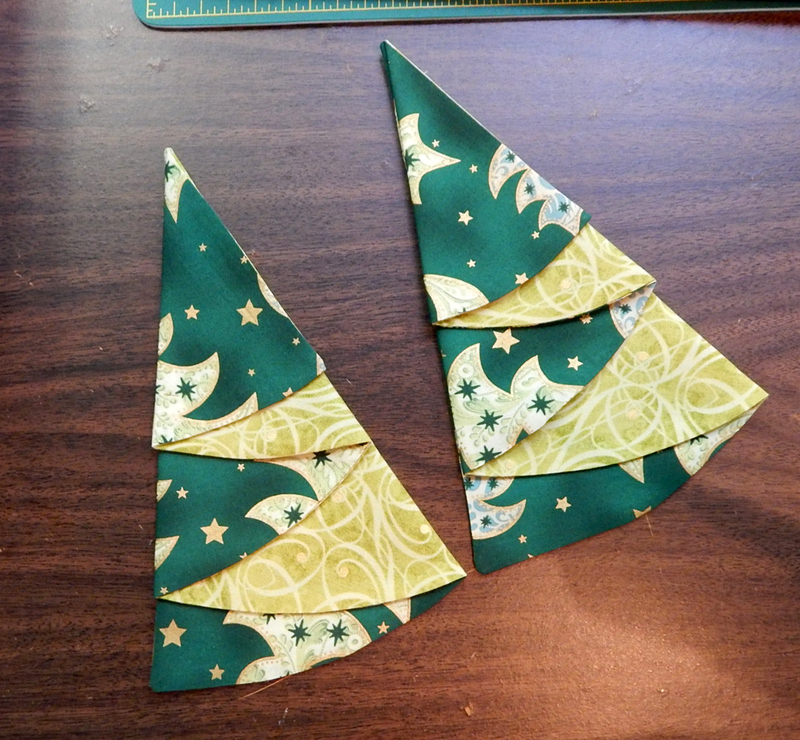 One person made several dozen of the cute half-circle napkins that fold into a Christmas tree. 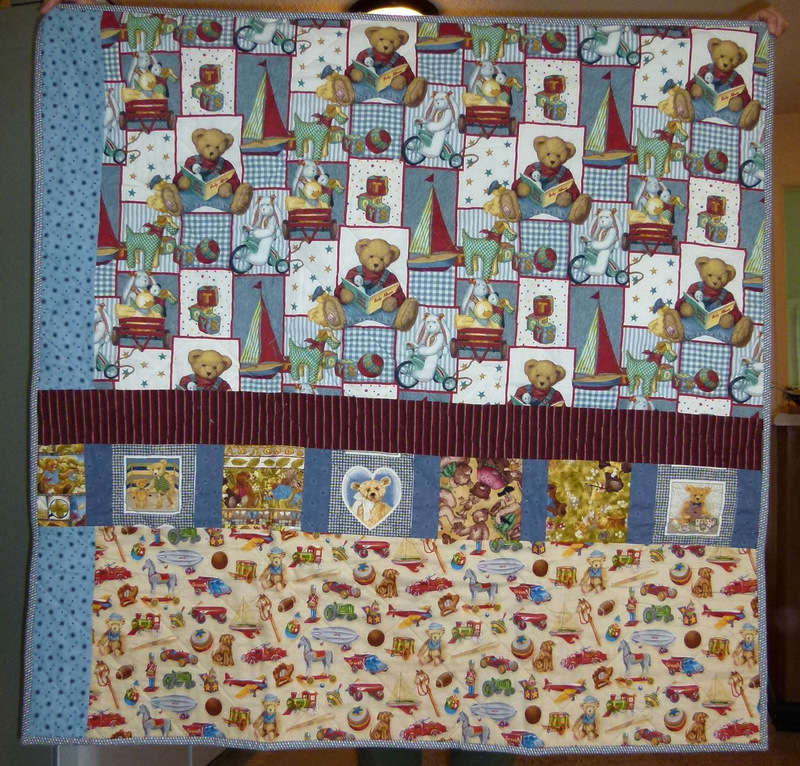 She made a lot of place mats, too, but I didn’t get a picture of those. 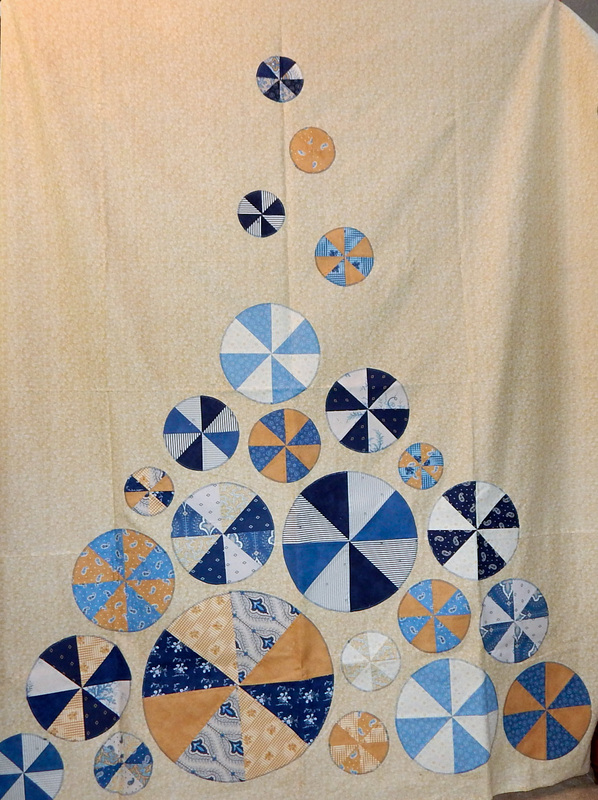 I won a year-long online quilt retreat! What the heck is that? Here’s Lora Douglas, one of the teachers from the retreat, to explain. 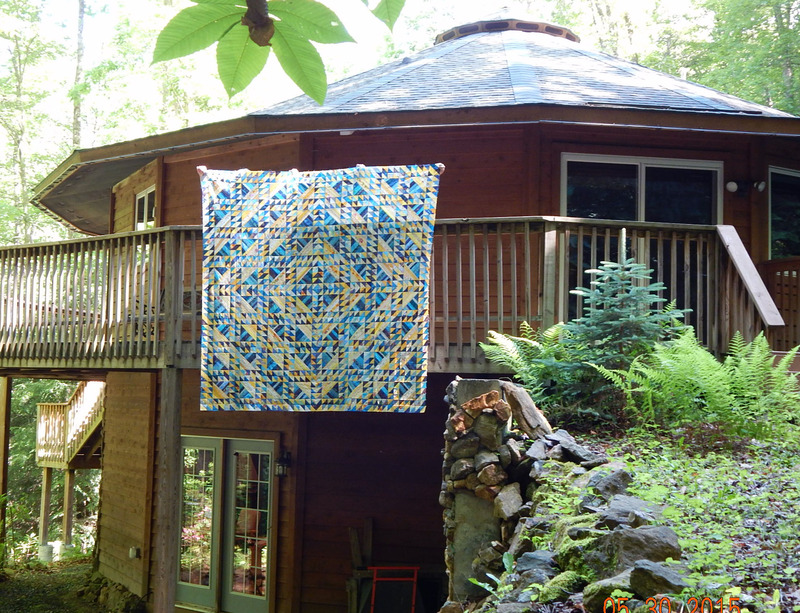 This year-long on-line, quilt retreat is sponsored by “Adventure Art Retreats”, which was started by Ilysa Ginsburg and Kira Slye. They launched “Polymer Clay Adventure” as an online experience in 2015 and got about 1000 subscribers! 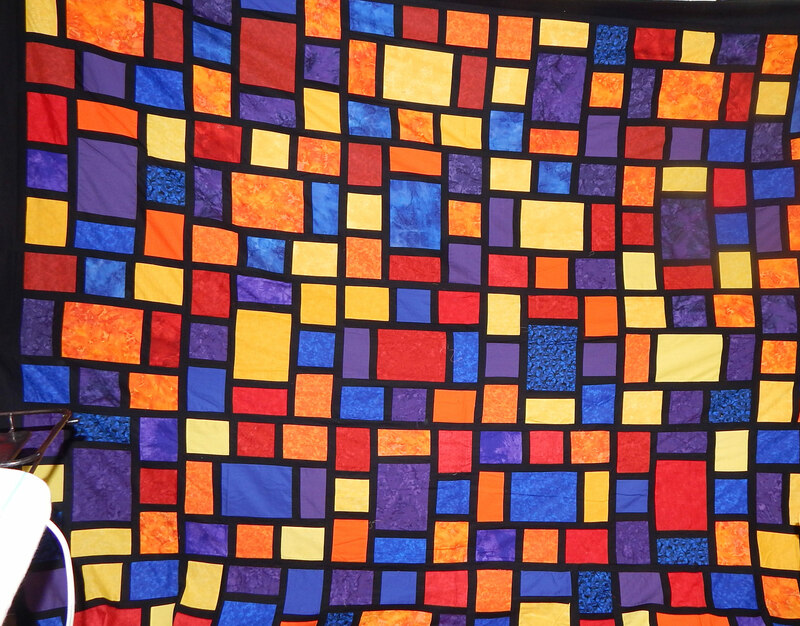 They’re adding a quilt adventure for 2016. .I designed the Roxie Bag as one of the monthly projects for the retreat, and I’ll be teaching it by online video. When I couldn’t find a pattern using flex frame hardware that was easy to make and looked great, I designed my own. 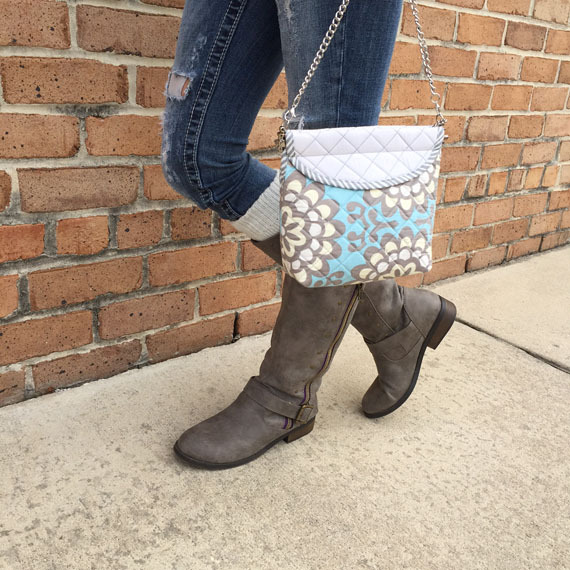 It is perfect as a cross-body bag for carrying a cell phone and other small items. 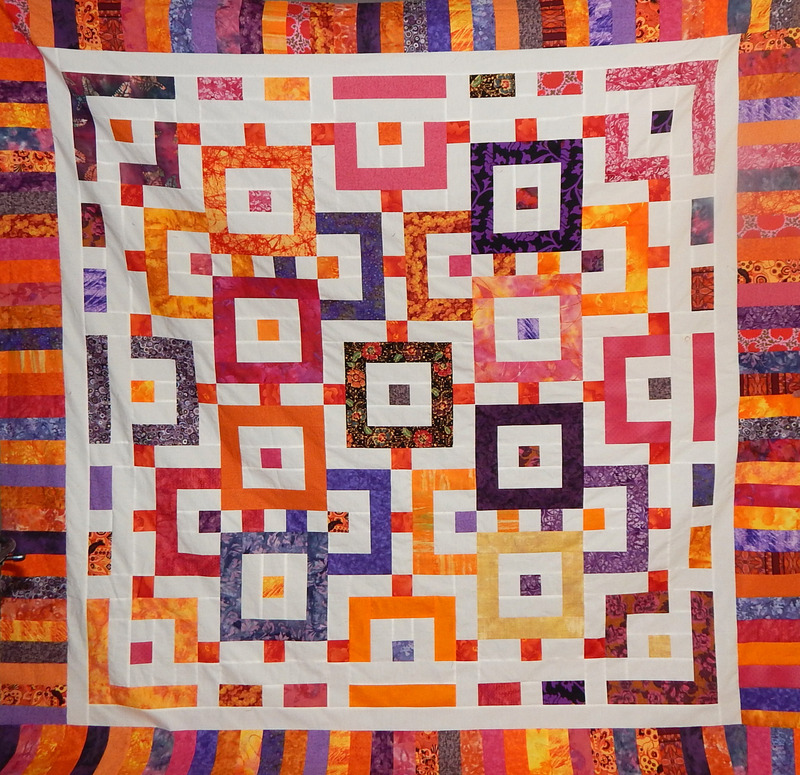 “Quilted Adventure” is the online equivalent of a traditional quilt retreat where you meet other quilters while learning new things. 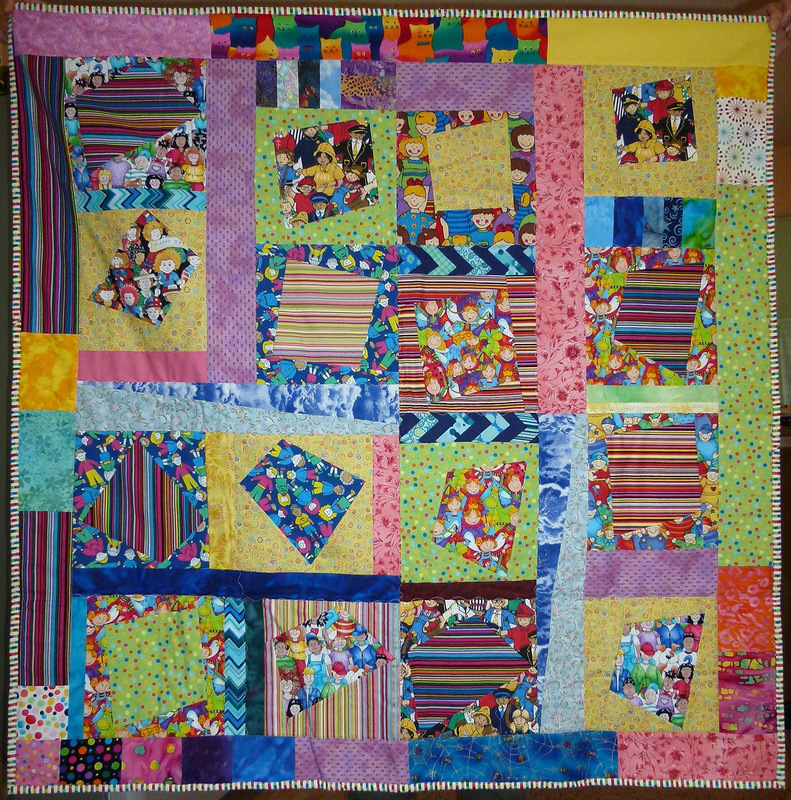 “Retreaters” can take a new class each month; participate in live-stream events with our host, Vanessa Vargas Wilson of The Crafty Gemini; receive monthly clues for a mystery quilt; and take part in swaps. There will be a newsletter to keep participants informed of upcoming events. The instructors will be available to answer questions throughout the retreat. It’s going to be fun! 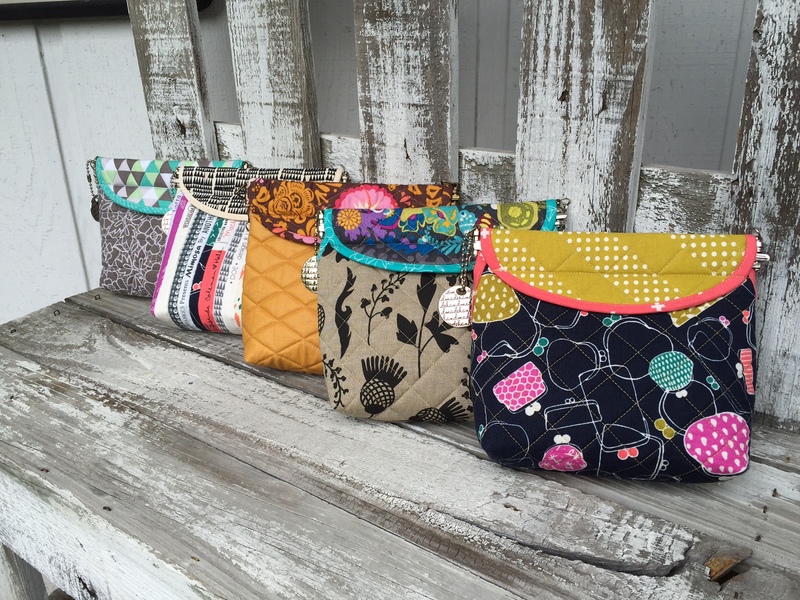 Another Roxie bag–how many samples did she make??? 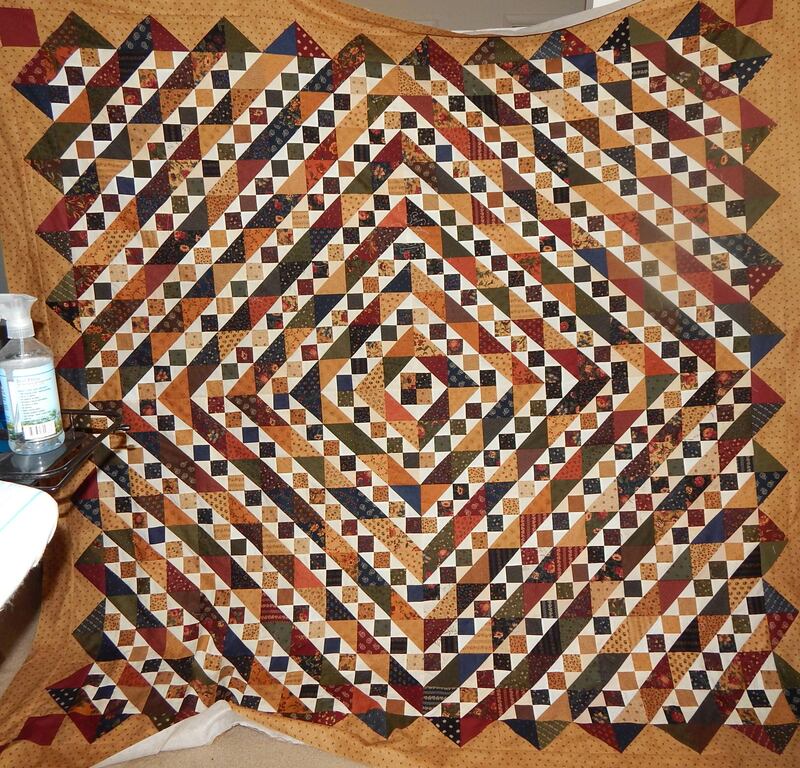 Here is Jerri’s quilt of 3392 pieces, made from a pattern in one of Bonnie Hunter’s books. 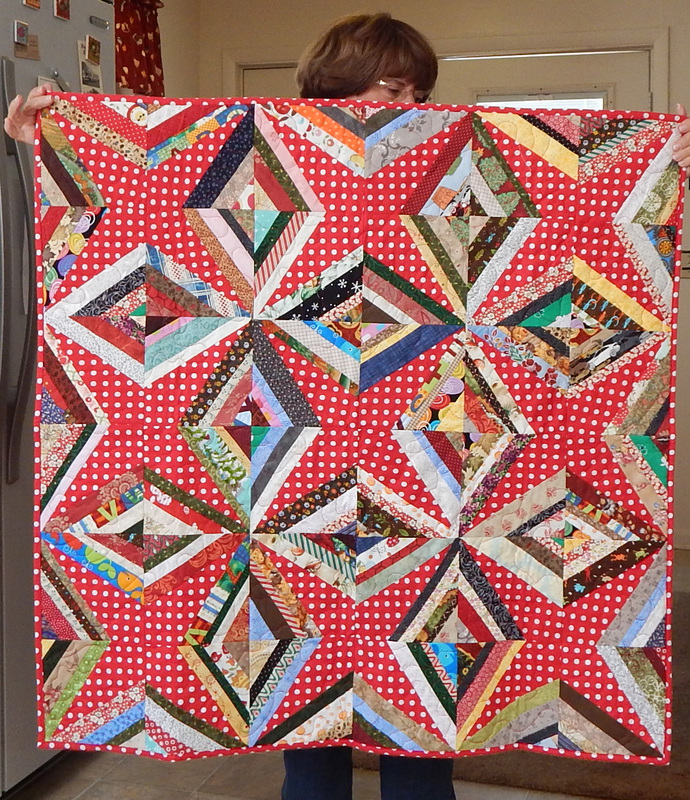 Jerri made this for a Little Sisters of the Poor fundraiser, and it certainly should raise a lot of funds! It is beautiful. 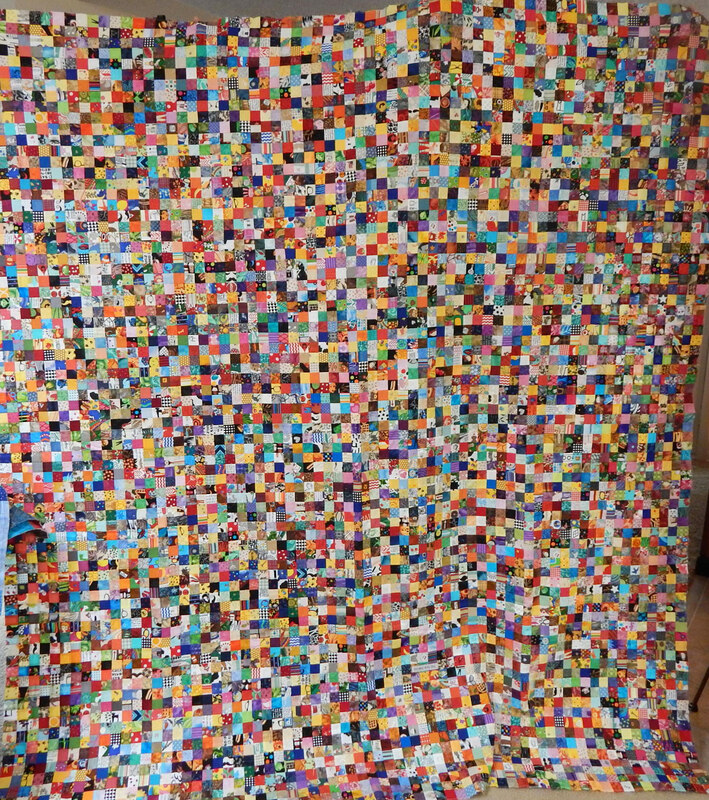 And she had the sense not to count the number of pieces until she was FINISHED with the project! Even so, it took almost a year to complete. I am VERY impressed that there is not even ONE block is turned wrong!. 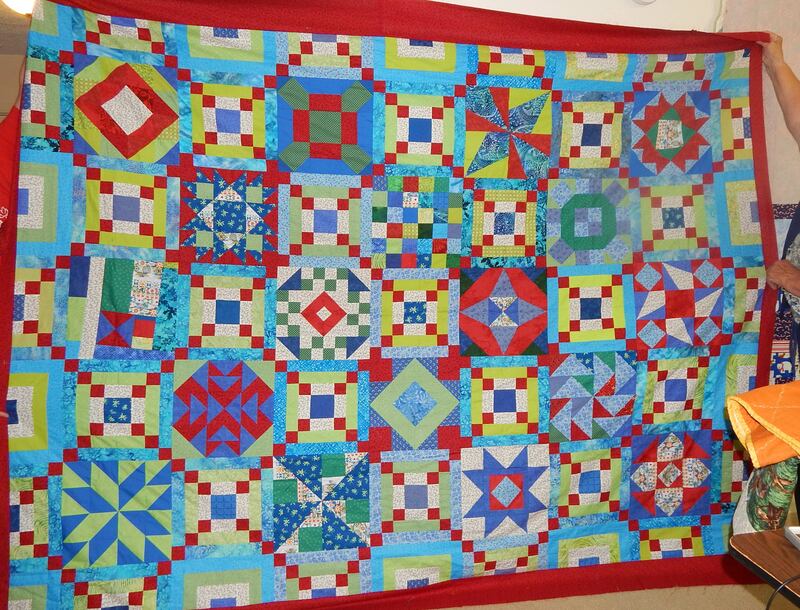 This is a HUGE quilt! 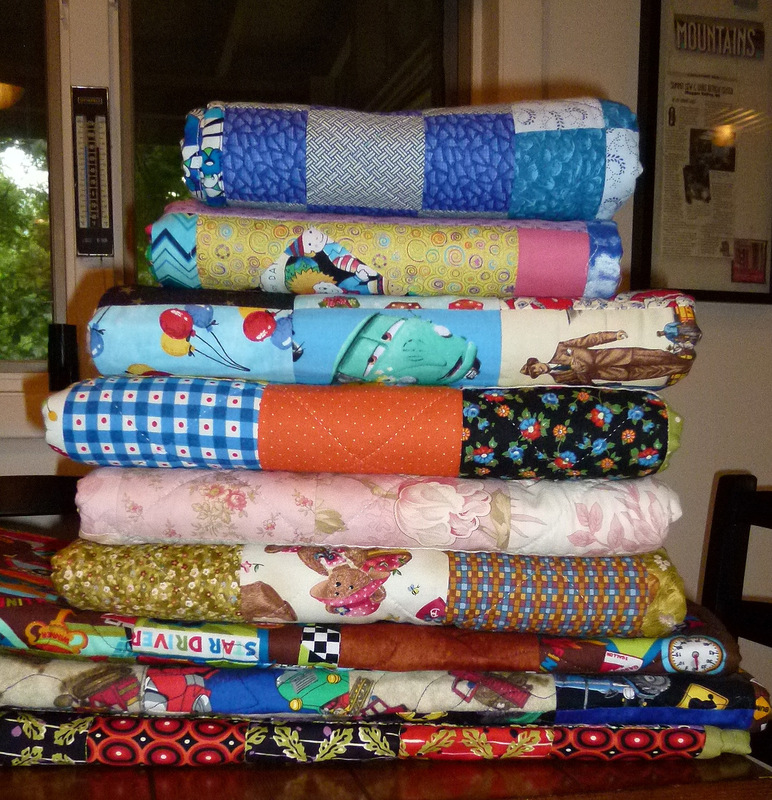 And here is the latest stack of donation quilts from our group. 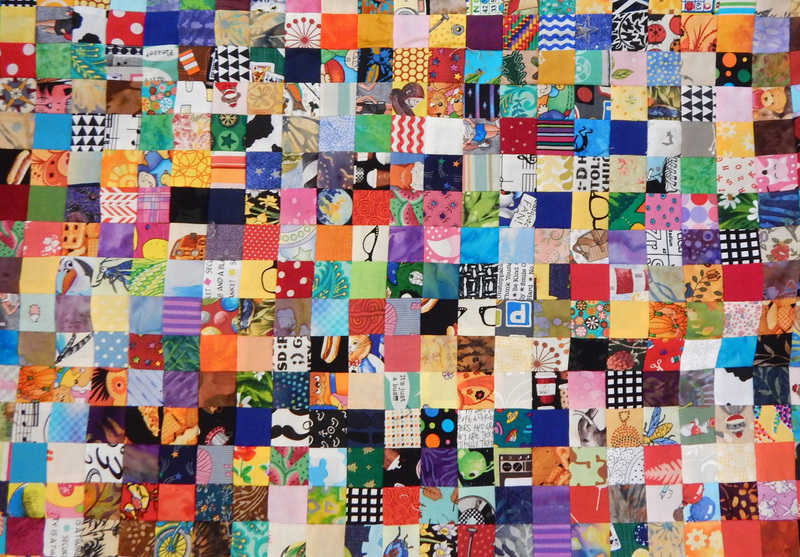 So far everyone is keeping up with the commitment to make a donation quilt each month, and one over-achiever is several months ahead of the rest of us!!! 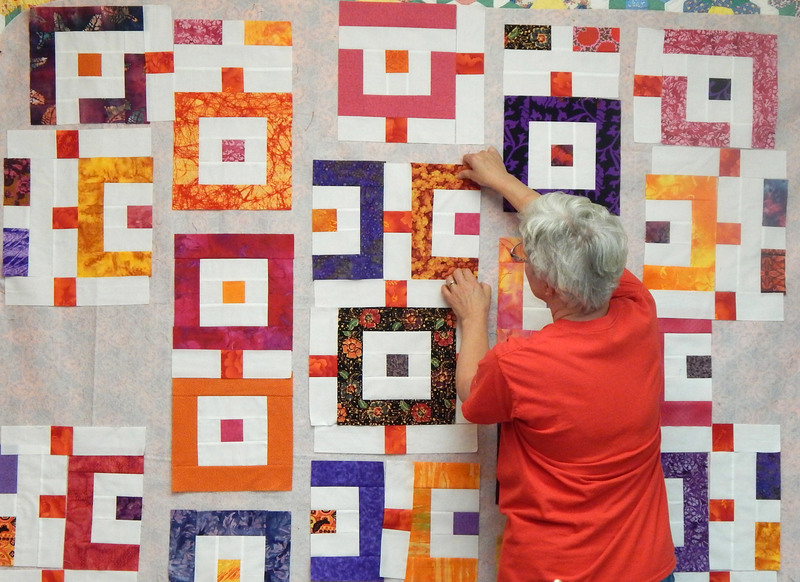 As you probably can see in the photo, another over-achiever quilts hers by hand! I am always amazed by my very accomplished friends! 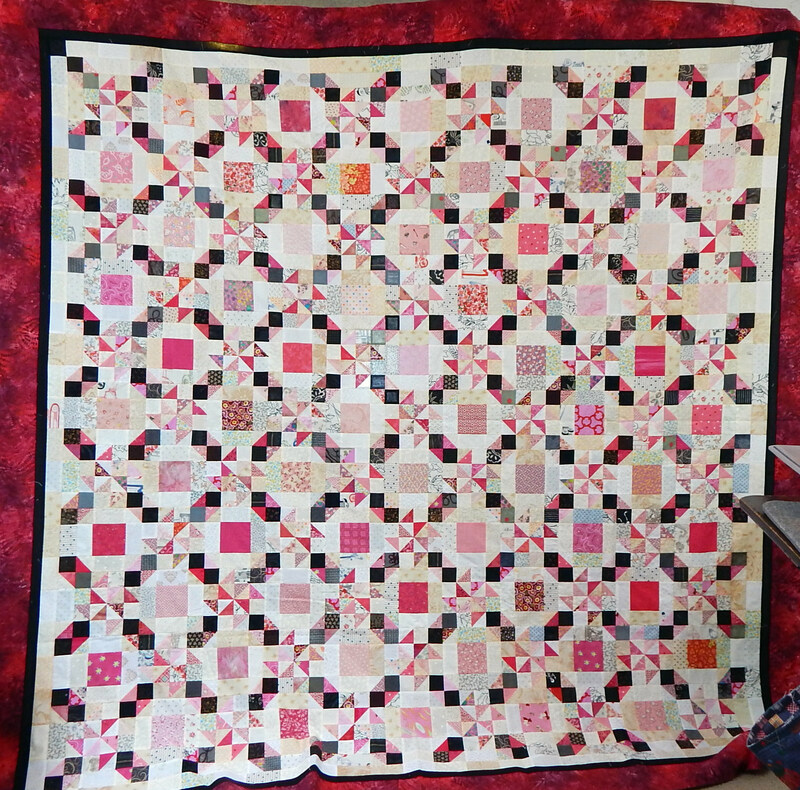 As soon as Jerri finished the BIG quilt, she started this beauty! Our latest block swab is monochromatic slabs. 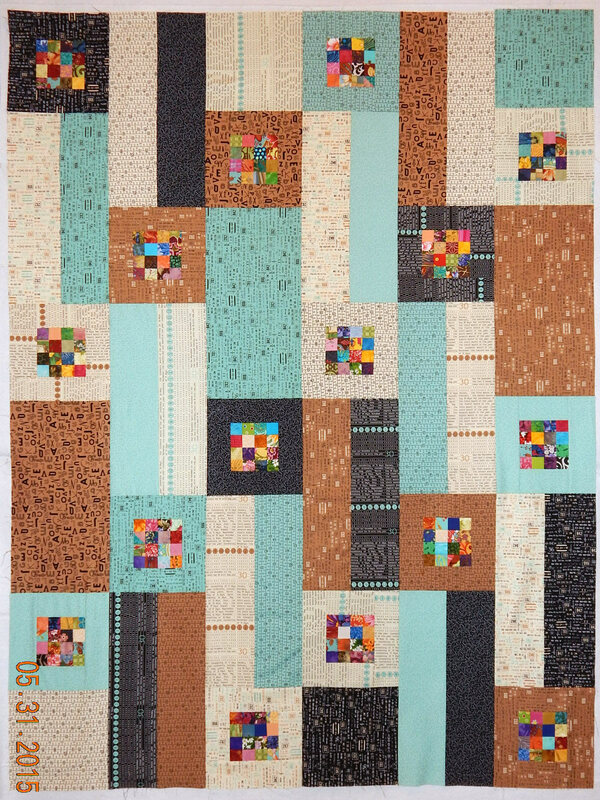 Each of us chose a color we wanted, and as soon as we swapped one group member turned her blocks into a donation quilt. Talk about quick work! 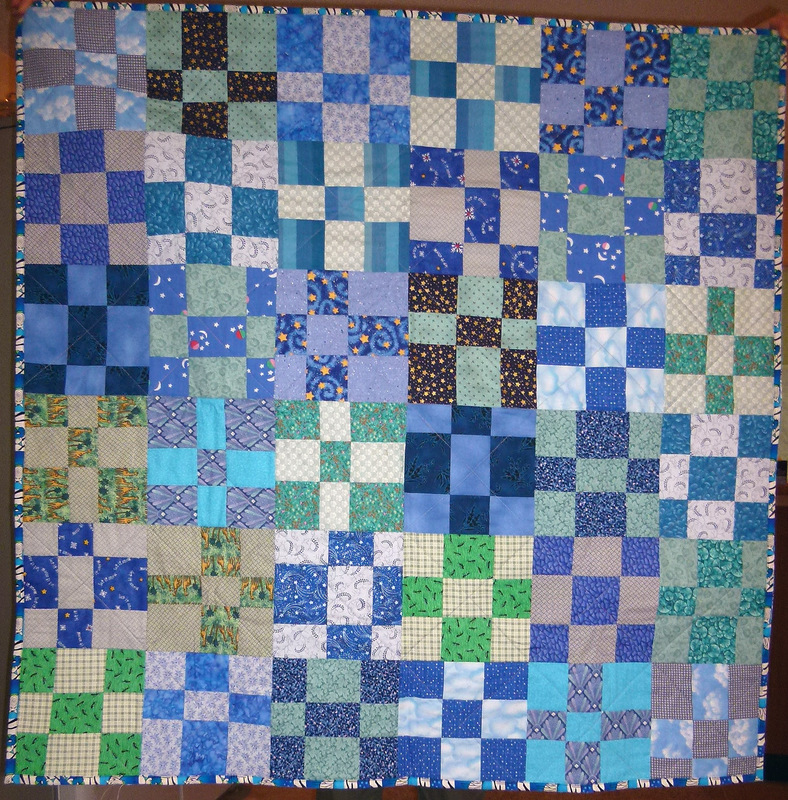 When I got the slabs, I immediately started cutting them up and adding accent strips of blue. So far I really like the result. More on this later. Your Inner Designer 6: Copy Somebody Good! Truly original ideas in design are really, really rare More often good designs are inspired by other good designs, and most designers start by copying other people. There’s nothing wrong with that–just give credit! 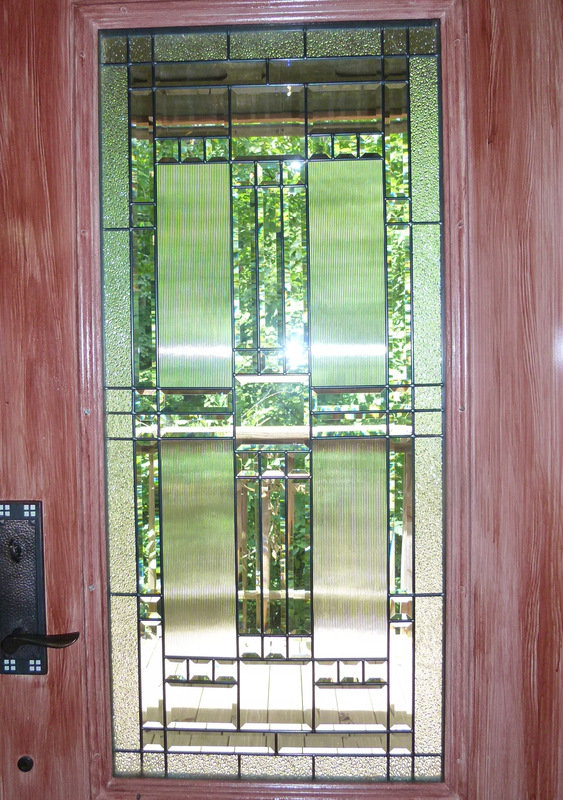 For example, here’s a door I admire in a friend’s house. 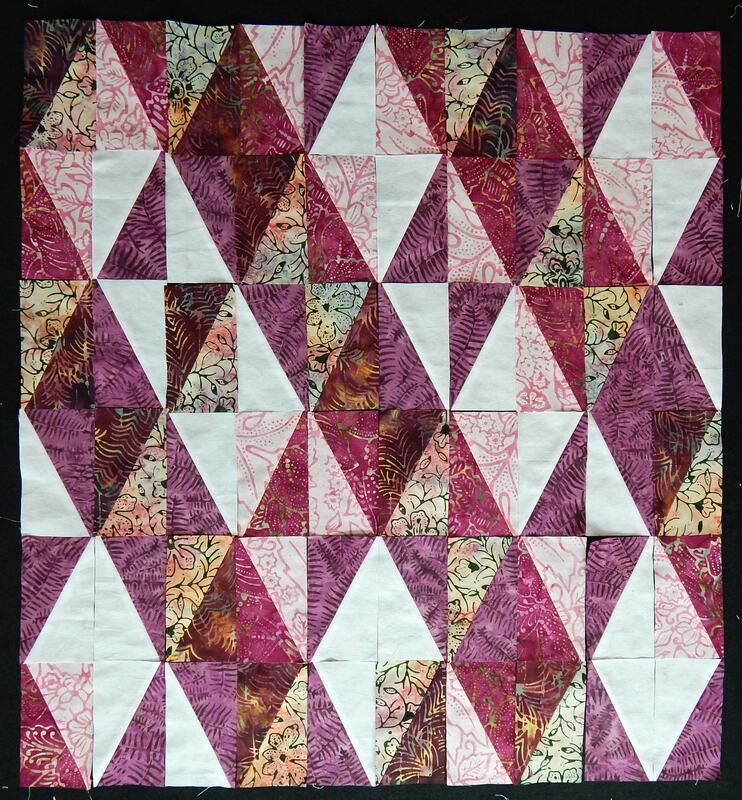 It got me thinking that it would be nice to make her a table runner with a design similar to the glass in the door, especially since the dining table is right by the door. 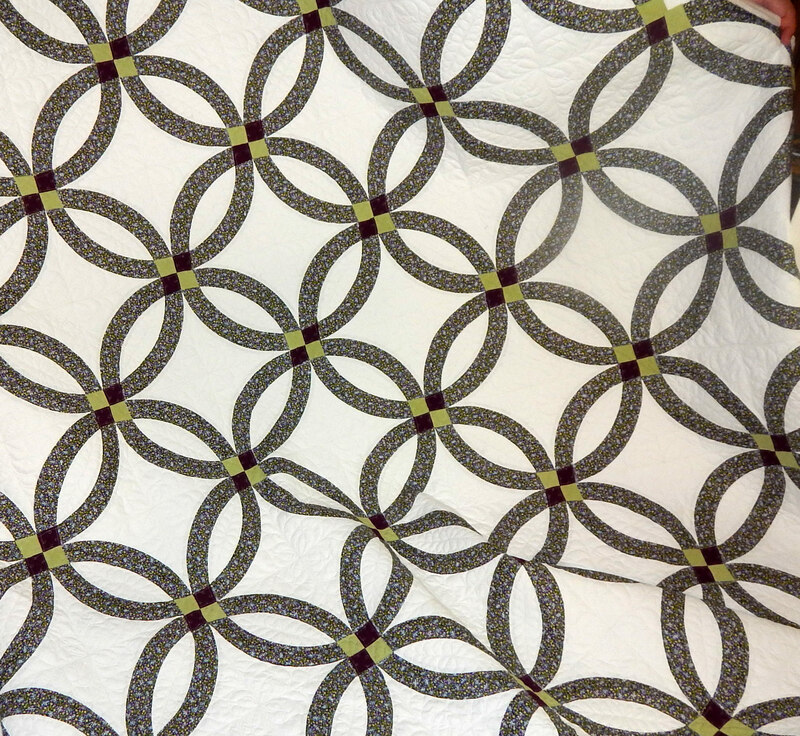 I may start out by copying the design, but my table runner won’t be an exact copy. I want it to be obviously inspired by the door, but I probably couldn’t make an exact copy even if I wanted to. 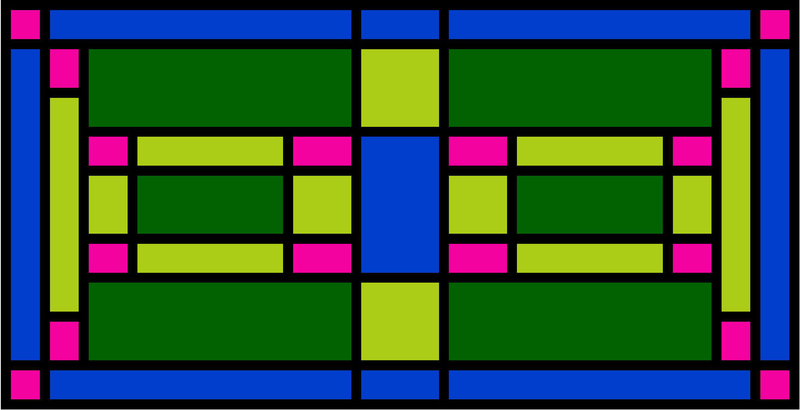 And I’m not going to sell it as my own “original” design without reference to the door, either. This one has a little more detail. Another master of this style, popular in the early years of the 20th Century, was Charles Rennie Mackintosh. 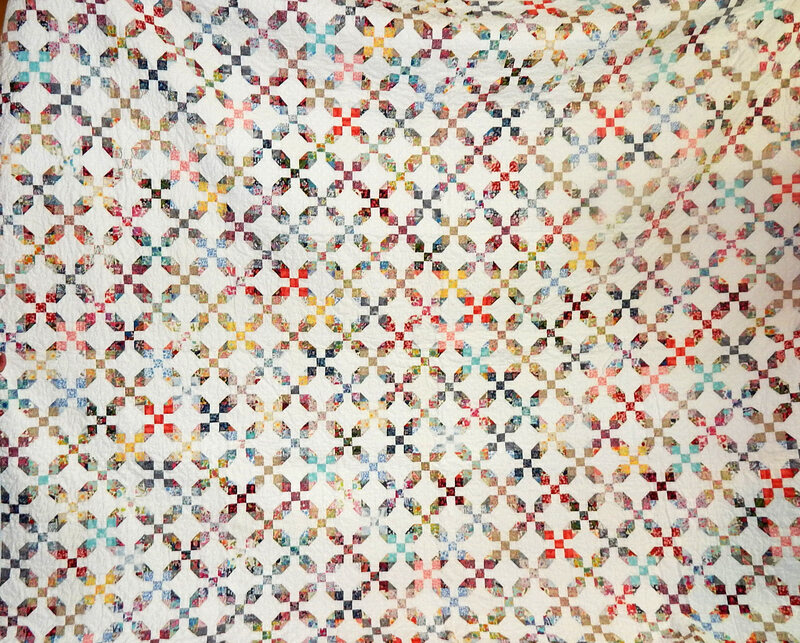 William Morris textile and wallpaper designs were the same historical period, and you may have seen Moda’s extensive line of William Morris-inspired fabrics. So go look at some books on the history of design (the history of advertising works too) and make some designs inspired by what you see. It’s a good starting place when you think you don’t have any ideas, and you’ll eventually come up with something your really like. 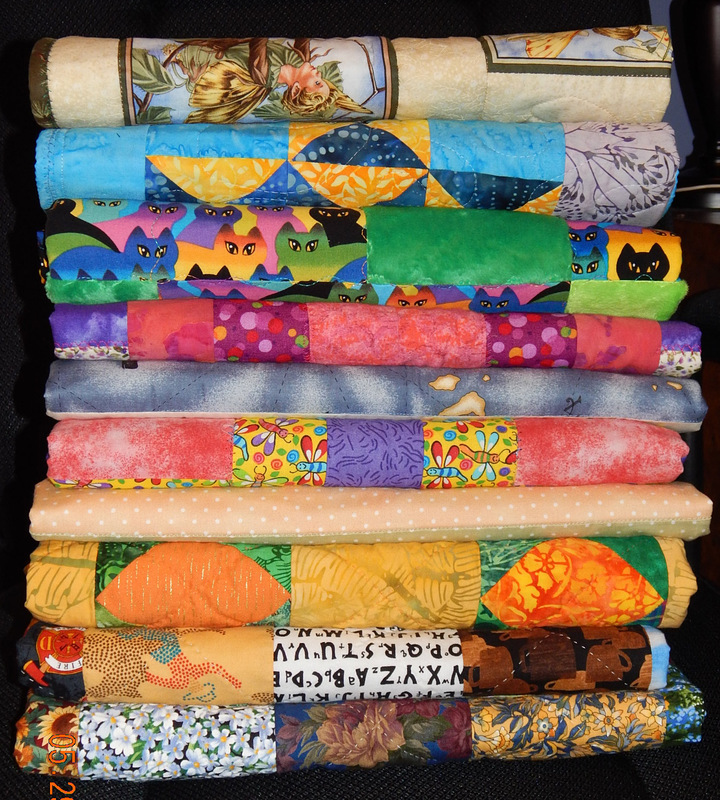 Then it’s time to make a quilt! Your Inner Designer 5: A Program to Make Your Own Palette! 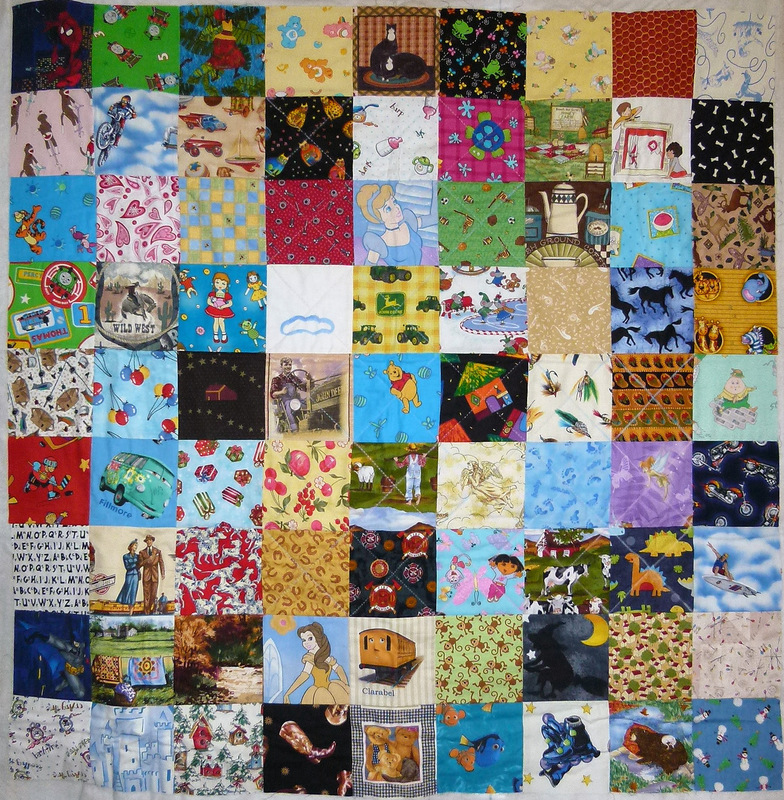 I have a little group of quilty friends that I retreat with at least twice a year. 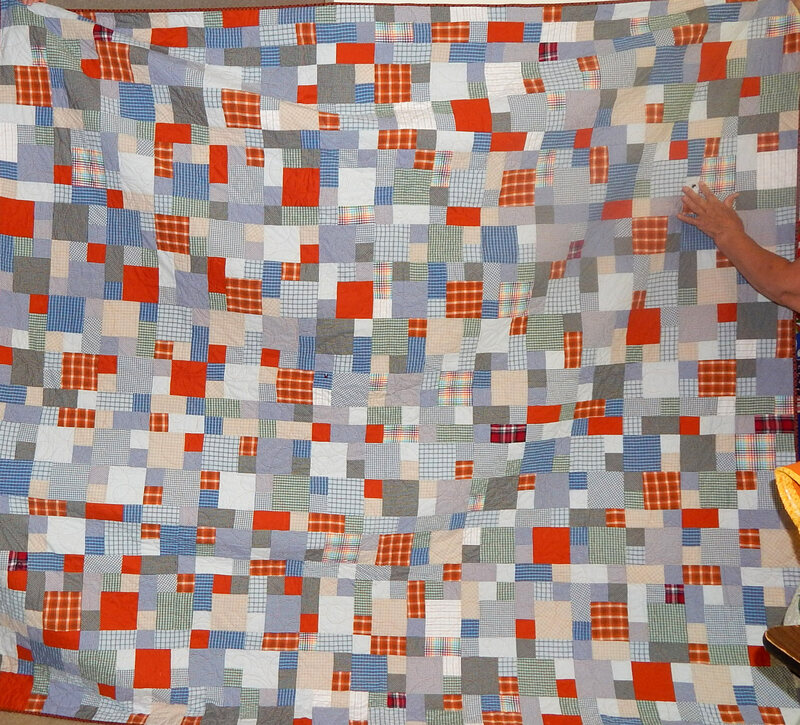 We all make quilts for Ronald McDonald House of Cincinnati. 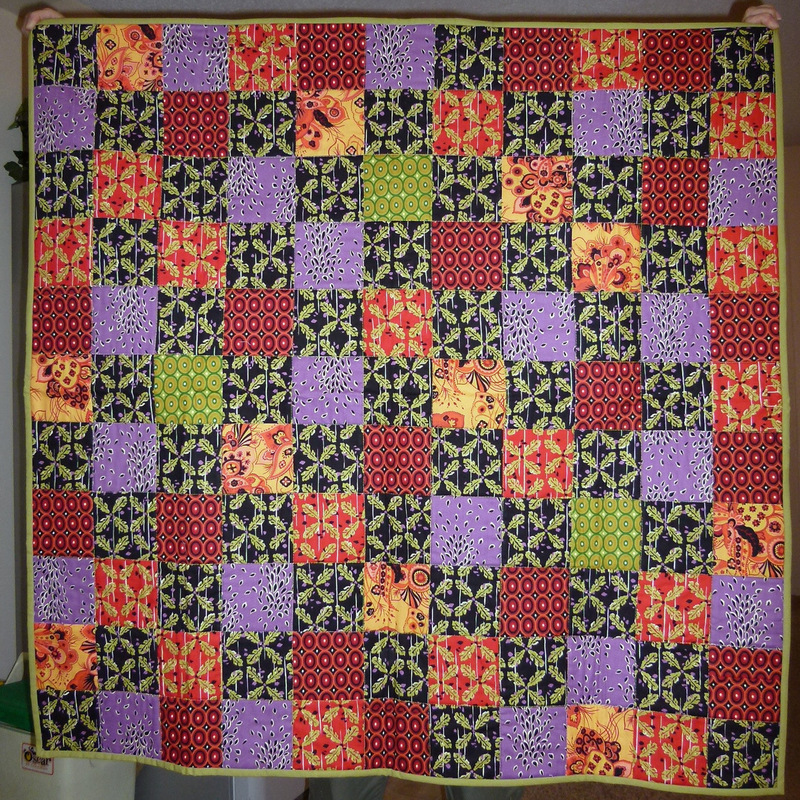 This last time, just 3 of us finished a total of 10 quilts! Here are some of them. 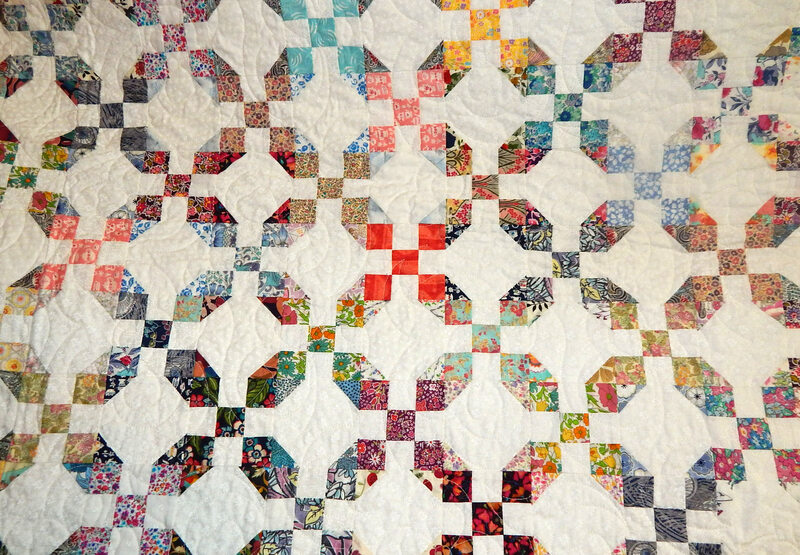 Anyway, enjoy this little quilt show! 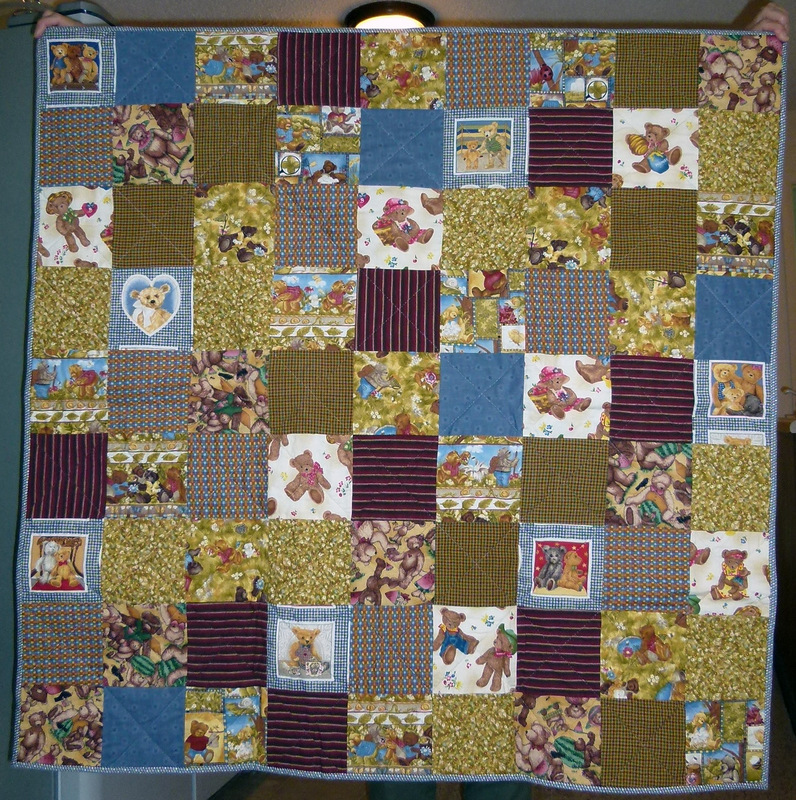 And check with your local Ronald McDonald House if you’re interested in donating quilts to them. 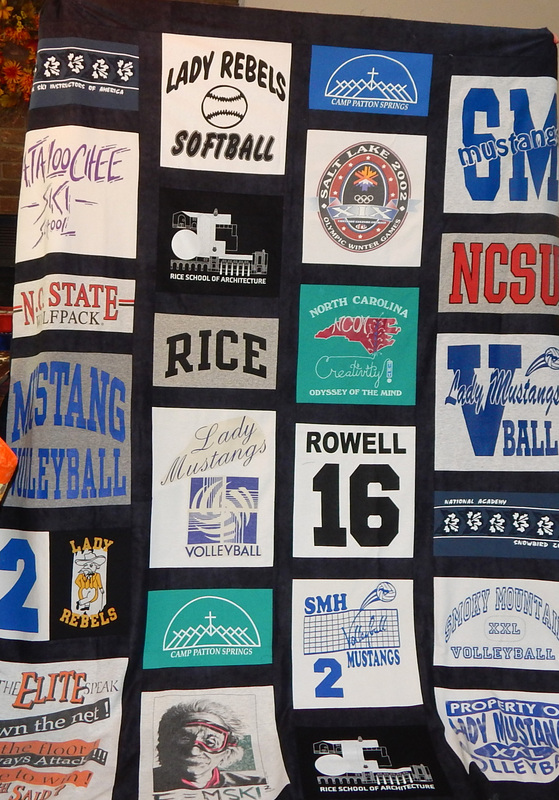 More leftovers–can you tell some group members have grandsons? 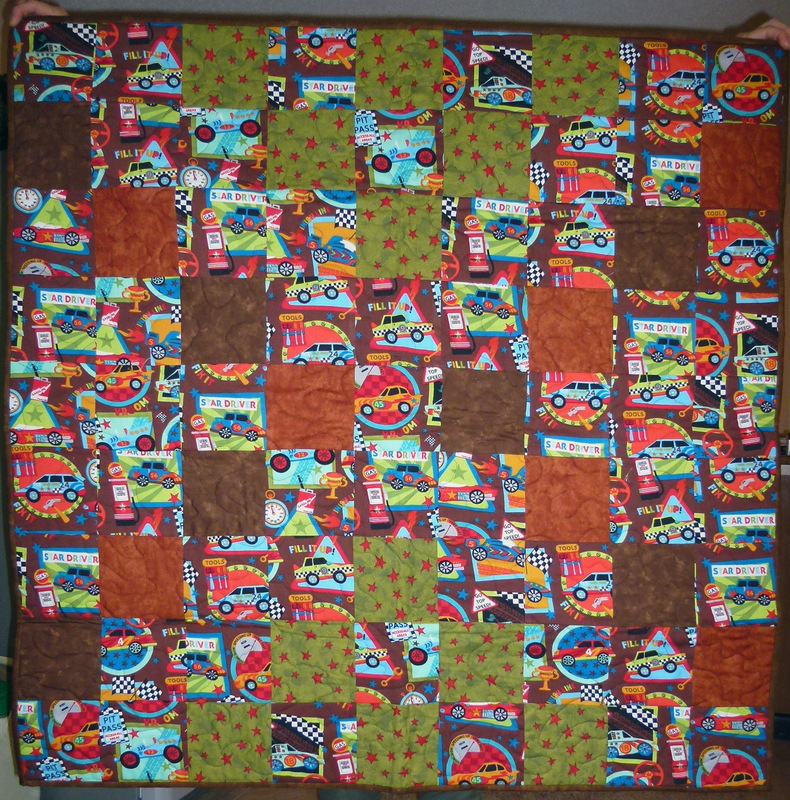 Boy Scout theme–there were 2 of these–and look at the quilting, 1/2″ apart! 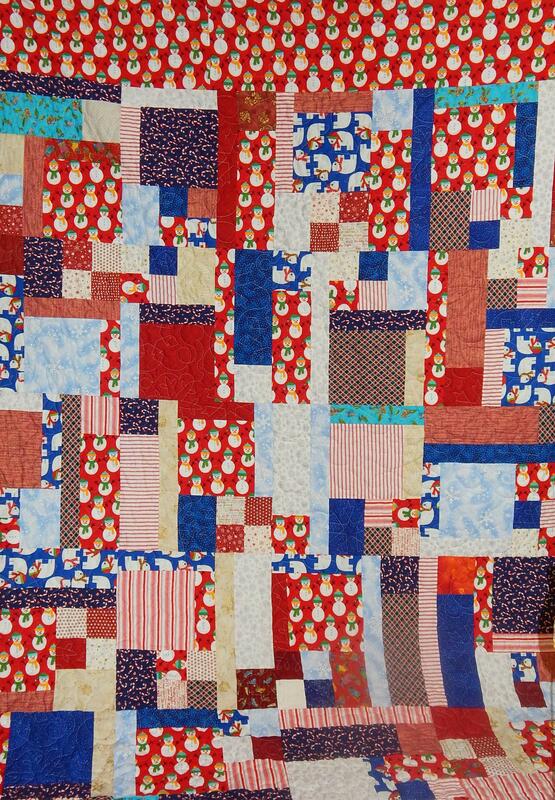 When people ask me what I do I say I’m an artist and… often create things that have the structure of a quilt.. 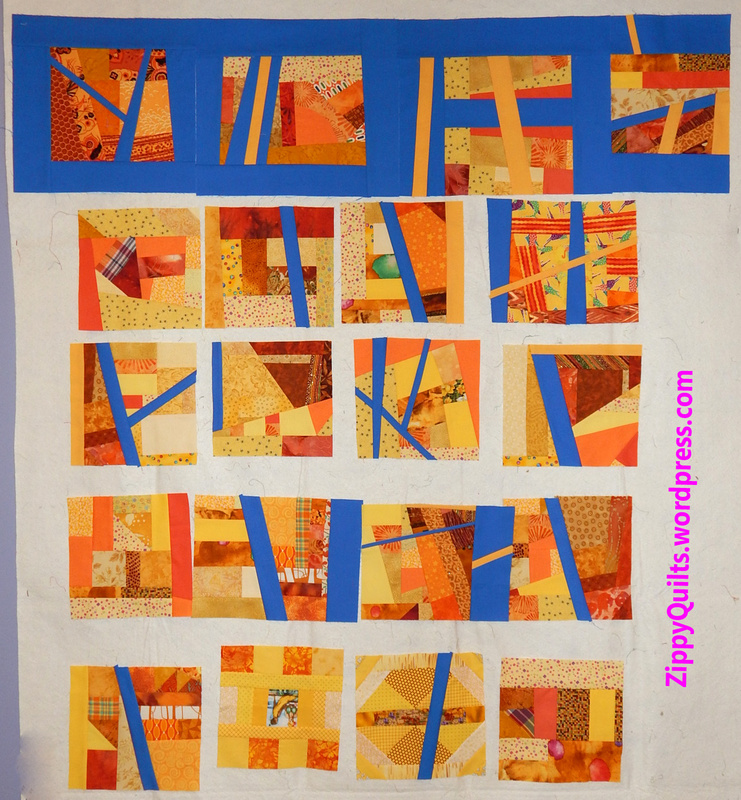 I am definitely a quilter. But I also play with other media so that term doesn’t cover it all. 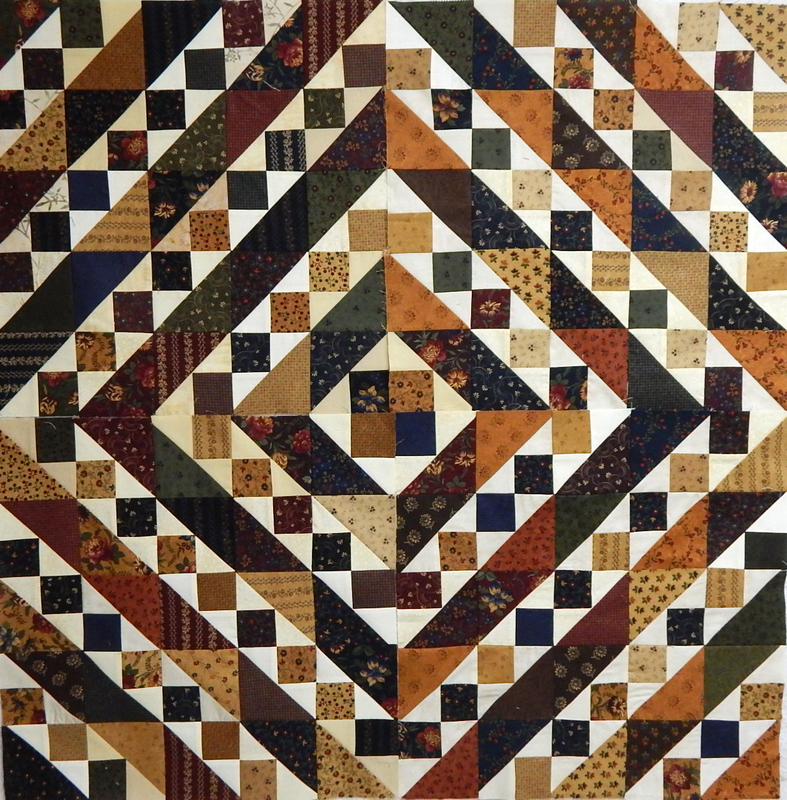 People have a set picture in their minds when they hear the word “quilter” that does not match what I do. What’s your most encouraging phrase to keep yourself going? Here are a few favorites: No Fear, Just Do It, Just Keep Swimming. I am inspired often by the materials I use. 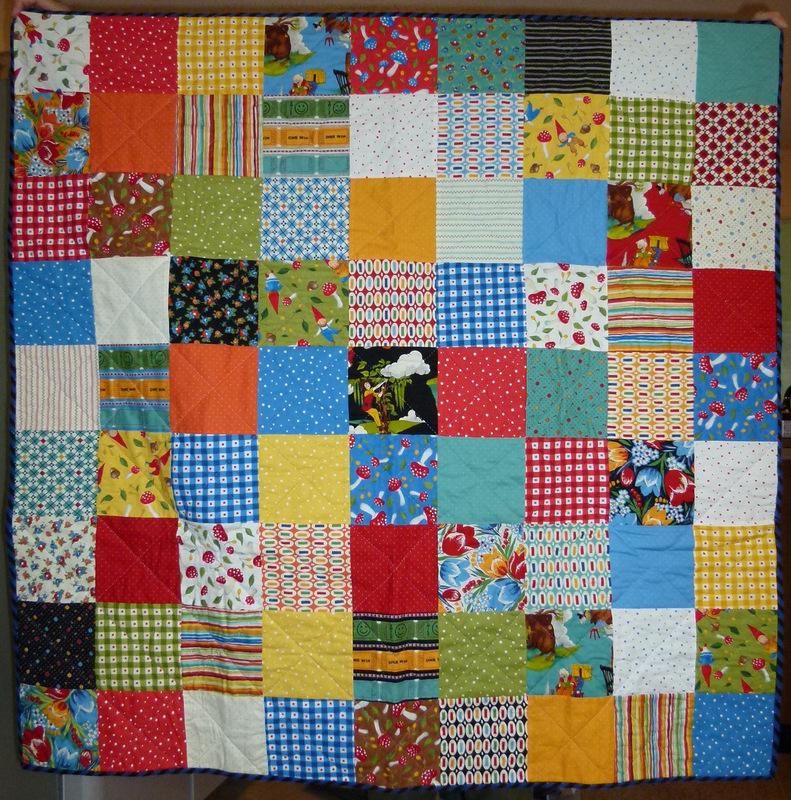 Aren’t we quilters because we love to touch fabric? 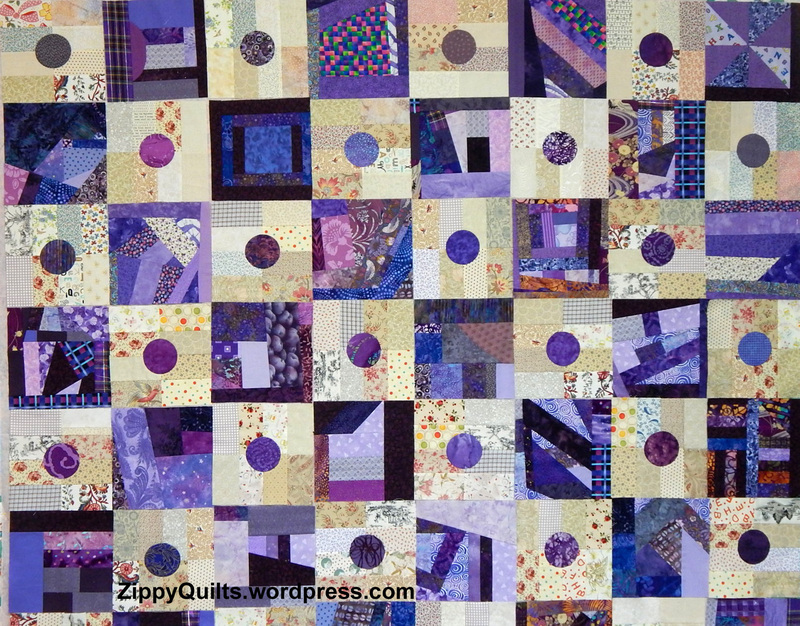 Everyone that sees textile artworks has an immediate connection with cloth – we are wrapped in cloth from the day we are born… You know everyone wants to pet the quilt but rarely do people reach out and touch a painting. 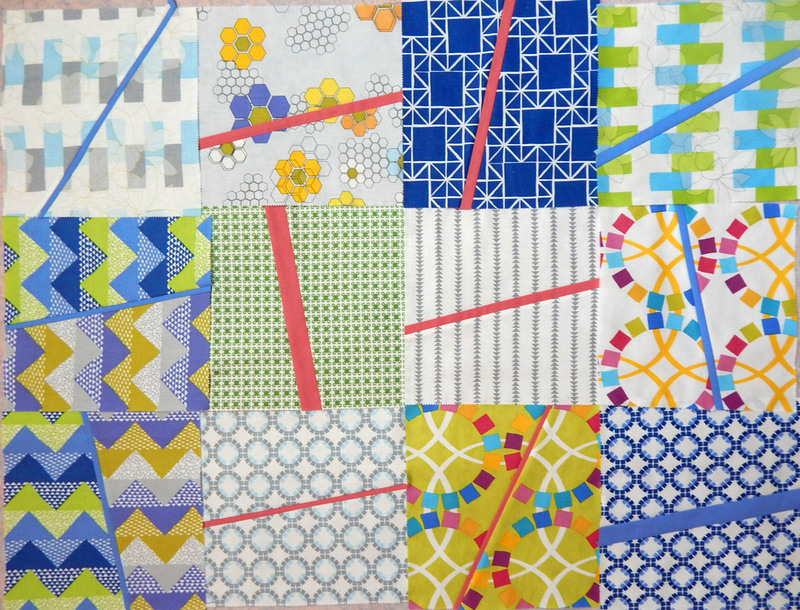 My abstracts and often improvisational art spring from a small collection of cloth and embellishments that I take with me on a trip or to whatever practice or lesson my kids are at. Share a recent work with us? Lyric teaches a variety of techniques, and has a fun-sounding retreat coming up this fall in Blowing Rock, NC. Go to the “learn” section of her website and look at the “Once In A Blue Moon Retreat”. While you’re there, look at all the other things she’s teaching, too.